KOROR, Palau—What would a country run by baseball players look like? Would it be a sabermetrics-driven technocracy? A clutch-obsessed theocracy? A cup-adjusting macho dystopia? This isn’t a thought experiment. It’s happening right now in Palau, a tiny archipelago of some 20,000 souls located in the Western Pacific that is currently playing host to a radical experiment in letting the sluggers run the show. Baseball has dominated the cultural and sporting life of Palau for almost 100 years, which is about four times longer than Palau’s been an independent nation. Over the years, Palauans have shaped the game to fit their island lives. Kids learn to play with bamboo bats and coconut-leaf balls. Pitchers chew betel nut instead of dip. Monsoons rain out not just games and series, but entire seasons of league play. Local traditions of witchcraft have crossed over into the country’s sporting life; even today, it’s not uncommon for accusations of black magic to fly after particularly contentious games. (I’ve been reporting on and off from Palau for seven years, so I’m used to it. THIS pitcher’s dad was a known wizard; THAT team’s manager caught women from an opposing village burning leaves over home base.) Baseball as it’s played in Palau is a decidedly Palauan thing. But baseball has also shaped Palau. It’s more than a national pastime here. It’s an organizing principle—or, more accurately, a re-organizing principle. Before the 20th century, Palau was a matriarchy. Women controlled most aspects of society, and men were limited to fishing, fighting, and handling village-to-village diplomacy. Then colonial rule brought centralized government—and baseball—to the archipelago. Ever since, these two male-dominated worlds have fed on each other, with Palau’s baseball leagues serving as a kind of farm system for government service. Scores of congressmen, senators, diplomats, and heads of state have passed through Palau’s dugouts on their way to political power. It’s hard to overstate baseball’s effect on the male Palauan mind—and, by extension, on the body politic. Many countries still play the sports they first learned from their colonizers, of course, but Palau’s remoteness has allowed baseball to flourish in a way that’s remarkably independent of the global sports-industrial complex. American sluggers aren’t revered by Palauans as legends in the way that NBA stars are in the Philippines. Nor have any washed-up MLB pros found second acts or adoring fans in the Palau Major Leagues in the way that, say, Bobby Valentine became a cuddly mascot in Japan. Instead, and despite a style of play that tends toward small-ball, all the game’s glory has gone to male Palauans. Men who might rate elsewhere as ballboys have instead become authentic sultans of swing. Look at it a certain way and the story of baseball in Palau is the heartwarming, underdog, Disney-ready tale of male liberation…that exactly no one is asking for in 2017. From a different angle, though, Palau’s baseball history can be read a cautionary tale, and a parable of what happens when society’s overlords let one gender suit up while the other rides the bench. You might expect this story to begin with the Americans, who invented baseball in the 1800s, ruled Palau during the decades after World War II, and have their own history of resistance toward women in power. But the sport’s roots in the Pacific actually begin with the Japanese: Baseball first came to Palau in the 1920s under the auspices of the Japanese Empire’s colonial administration, which annexed Palau as part of a plan to fill the Pacific with Japanese settlers. The Pacific Islanders living on those islands and archipelagos were something of an afterthought in that colonial gambit; the Japanese saw the locals as easy targets for cultural assimilation. Under Japanese rule, Palauans were required to attend Japanese public school and pledge loyalty to the Emperor. Local religion was suppressed, and local men’s clubs, called bai, were disbanded. Baseball soon filled the cultural gap. In 1925, the Japanese taught the game to their Palauan servants in the colonial administration. The jobs held by these first Palauan players spoke to their low position in Japanese society: First baseman Lekeok worked a tea server; Bismark, the team’s center fielder, was a “helper” at the Japanese communications office; Third baseman Ngirakesau served as a bicycle messenger for the Post Office. On the field, however, the Palauans soon surpassed their colonial overlords. A 1928 series between Palau’s all-star team and a Japanese squad resulted in a surprise win for the locals. The Japanese responded by swiftly banning all future interracial competition. World War II happened before Japan could complete its “civilizing mission.” Yakyudo was blasted away in a hail of American bombs, along with most of Palau’s schools, roads, houses and hospitals. 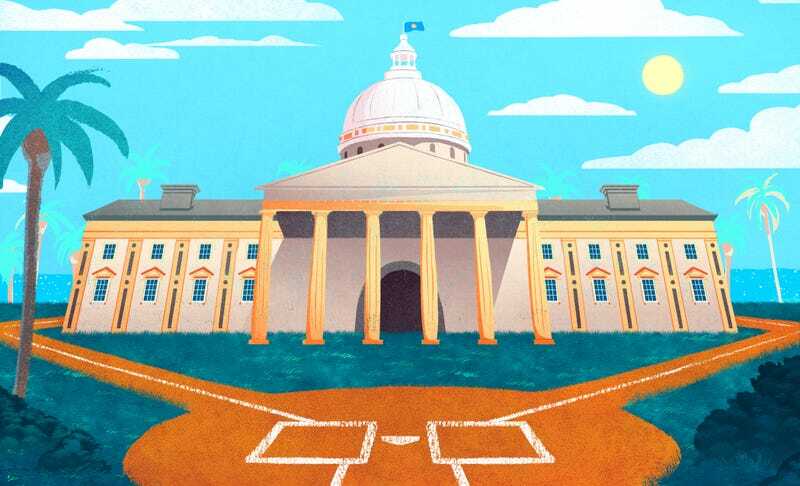 The island’s infrastructure would take decades to rebuild but baseball came back much sooner, and with the full support of the island’s new U.S. Military overlords. By 1948, the U.S. had organized village teams into an archipelago-wide pennant race. Baseball was a cornerstone of American efforts to remodel Palau’s society—so much so that GIs used M-boats and army trucks to ferry village teams from island to island. These inter-village games were the start of what is now called the Palauan Major Leagues; at the time, though, they were simply a welcome diversion for shell-shocked Palauans—especially for Palauan men. Even before the war, the old matriarchal system had left a lot of young men idle. Women controlled all property, money, and hereditary titles in a village. Men could traditionally make their names through fishing and military battles, but both activities were in decline as the U.S. pushed Palauans toward peaceful, more urbanized living. As for Palauans? They were simply the best. “Palau, our home and people were a great motivating force for us,” recalls Frank Kyota, a left fielder on the national team who is now a senator. “Our idea was, never lose! We’re Palauan, we cannot lose!” Whole villages would empty to greet the national squad upon its return from overseas; on these occasions the women of the village prepared grand feasts of fish and taro while players regaled their neighbors with inning-by-inning highlights. By 1978, Palau had rejected membership in the U.S.’s Micronesian federation and resolved to go it alone. The negotiating team leading this independence fight included several star baseball players and coaches—among them future President Toribiong, of the Airai Aces, and Joshua Koshiba, of the rival Aimeliik team, who would later become Palau’s longest serving senator. I’ve been reporting on Palauan politics since 2010, and in my trips to the country I’ve passed many a sweltering afternoon on the bleachers of the national stadium, cheeseburger in hand, cheering on high school and village teams. At night, over beers on the waterfront, I’ve heard proud retellings of the national squad’s heroics and anti-heroics during tournaments overseas. The anti-heroics tend to stand out the most in my memory—a Palauan batter chasing a Guam pitcher into the stands, bat in hand, after a beaning; a Palauan baserunner kicking an infielder as he rounded first. Both of these men are now senators. I’ve learned to keep my face noncommittal during allegations of black magic, which is the closest Palau’s gotten to having a doping problem. I’ve seen boys playing pickup games on the grounds of empty bais with a green wall of jungle looming the background. I’ve loved it all, and so I arranged for a reporting trip in hopes of profiling the national team...only to be greeted with endless rain and rainouts. As a result, I wound up focused on the off-field intrigue, cross-referencing playing rosters with government rolls and polling old-timers for their theories on how baseball and politics became so intertwined. It didn’t take long to figure everything out. There’s an undeniable symmetry at play in modern Palauan history. Before colonialism, exceptional men won glory by fighting in wars, then served their villages as “chiefs”—really, diplomatic messengers to other tribes—at the behest of the women who ran the show. When the colonizers came, Palau’s systems of valor and village politics were dismantled, and replaced with baseball and modern government. Men shifted seamlessly from one realm to the other, not as the result of some misogynist conspiracy, but more as a result of the soft bigotry of like flocking to like. When colonial administrators wanted to play sports with the locals, they unthinkingly gravitated toward the men, not the women; likewise, when they set up a “modern” political bureaucracy, they just as unquestioningly filled open positions with the men with which they felt friendly. On the surface, the new roles held by men in modern politics—governor, senator, president—may have seemed analogous to the diplomatic duties male chiefs had performed under the traditional system. In practice, however, modern politics has afforded men far more dealmaking power than they had ever enjoyed before. Women, for all their historical power in Palau, were left controlling an increasingly marginalized village system. What’s less clear to Palauans is what all this has done to the overall equality of the sexes. Viewed from the outside, Palau’s clubhouse-to-statehouse pipeline seems to confirm the dangers of gender inequality in sports. Every year, it seems, brings a new study in the US affirming the link between participation in sports and leadership in society. That, we’re told, is a big part of why Title IX matters: people who play sports are more likely to wield power later in life. Many of the Palauan women I know, however, hesitate to draw similar conclusions about their own roles in sports and politics. If I’ve heard it once, I’ve heard it a thousand times: While Palauan women may look disempowered compared to the heyday of the matriarchy, they still feel like they pull the strings. Men may control government, they say, but women control the men. Behind the scenes, I’ve seen women wear down their male family members until they’ve taken the woman’s line on issues like land proposals or environmental laws. So maybe there’s something to be said for the claim that Palauan women are leading from behind, and letting the men swing their bats around while the women quietly get on with the work at hand. At the same time, once men get into government—once they take those jobs as senators and presidents and governors, and spend their days in a statehouse located far away from their homesteads—these men have power that extends beyond the home or even the village. The female leaders denying that men run the show are the same ones I’ve heard speaking out against the betrayals of male leaders. Those are the same men that, for instance, seem determined to build a giant casino in Palau despite popular opposition; they’re the men who’ve taken lavish junkets abroad on the dime of land-hungry Chinese investors. They’re the men accused one year of misusing political funds, then cleared the next, then accused again, then cleared again. It’s men who get honored at overseas conferences for their activism on climate change, and men who are fêted at home with pennants and inaugural balls. It’s the men who get the glory, men who hoist the trophies. So: what would a country run by baseball players look like? The same as any other, more or less.